Frankie’s Fund: Help Give Every Dog a Great Sendoff | Will My Dog Hate Me? Many people have asked if there was an organization to which they could donate in Frankie’s memory. This has touched me no end. I confess that Frankie was not very philanthropic. Like most dogs, he was your basic narcissist: My food, my yard, my person. But I was that person and he gave me endless joy. I love the idea of being able to keep him in the limelight, while doing some good for other dogs. But which dogs? There are so many worthy causes. I adopted Frankie when he was five or six. During most of the nine years I spent with him, he would have been considered a senior. The label was meaningless — he was a frisky little bugger, often exhausting my energies — but it apparently prevents some great dogs from getting adopted. And there are no sadder words in the English language than “homeless senior dogs” — dogs that have spent years with people and then end up in shelters, confused and upset. The Grey Muzzle Organization improves the lives of at-risk senior dogs by providing funding and resources to animal shelters, rescue organizations, sanctuaries, and other non-profit groups nationwide. We are not a shelter or rescue group. Rather, Grey Muzzle funds programs such as hospice care, senior dog adoption, medical screening, and other special programs to help old dogs at animal welfare organizations across the country. But that’s still pretty general. I wanted to do something in Frankie’s name that was a bit more distinctive, given his own distinctiveness. And the last couple of months I spent with him gave me an idea. Just as I believe every dog deserves a good life, I believe every one deserves a good death — free from fear, in a friendly environment, and in the company of a person who cares, with as many good times as possible under his belt. And yummy food. There are amazing, selfless people who make this happen, sometimes called Forever Fosters. People who take in dogs near the end of their lives and care for them. They are willing to suffer the heartbreak of saying good-bye to wonderful dogs who may live only for a few months — or who may have several good years left. I can’t begin to imagine being able to do this. My admiration for these caretakers is boundless. But admiration doesn’t pay the bills. Frankie’s Fund is devoted to helping relieve these caretakers of their financial burden, of getting dogs in these homes palliative veterinary care — things like pain killers and evaluative exams rather than expensive, extreme life-saving measures — and perhaps in-home euthanasia, if a dog does not pass naturally and a final trip to the vet would be too stressful. The type of care you would give — perhaps have already given — your own beloved pet. The great sendoff every dog deserves. Grey Muzzle will dispense the gathered funds to foster caretakers through carefully vetted organizations. And then be sure to check the box to the right that says “Please send an acknowledgement to the individual or organization to whom I am dedicating my donation.” If you don’t want me to make your name public, I won’t. And I will never post the amount of the donation. But I need to able to tabulate and showcase the donations total. I’ll keep you updated here with progress. I’m aiming for $5,000 before Christmas New Year’s, but whatever the final number, a lot of dogs have already been helped. Remember, the size of the gift doesn’t matter. Small donations add up. ‘Tis the season for gift giving. 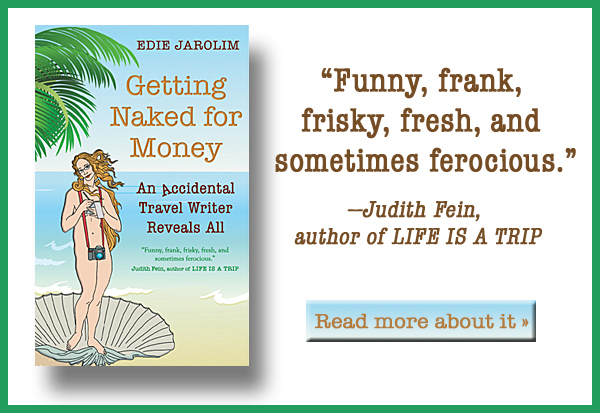 Perhaps people are asking you what you want for the holidays. 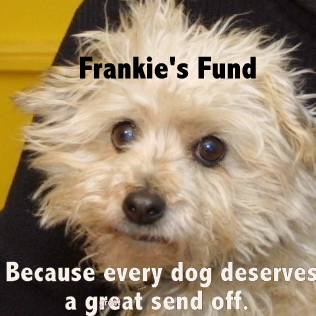 You might suggest that they give a donation to Frankie’s Fund in your name. Alternatively, if you have an animal-loving friend or family member who doesn’t need more stuff, this would be the perfect gift. And yes, you will get a gift donation acknowledgement from Grey Muzzle — which you can show to the IRS, because all donations are tax deductible. So do something nice for yourself, your family and friends. Help some deserving dogs. And keep Frankie’s name in the limelight, even during his retirement. What a great idea! I’m thrilled to be able to donate. Thank you for the opportunity 😉 I just hope I proceeded through the steps correctly. If you do not receive a notice that I donated, please send me an email to that effect and I will try again. One mistake I know I made was to call Frankie’s Fund, “Frankie Fund.” I hope that didn’t screw things up. Hope you are doing well. I think about you often. Thanks so much, Deborah! Any reasonable approximation of the name will let the Grey Muzzle folks know the donation is intended for Frankie’s Fund. I don’t know how often they will send me the names of the donors but I will definitely let you know, one way or the other. Woo-hoo! It must have arrived. Thank you so much. It is a wonderful charity, our donation is made. I am verklempt. Seriously. And pretty much speechless (and it takes a lot to induce that state in me). Thank you, thank you, thank you. A good friend of mine has been fostering dogs in the local Palliative Care program for years. After suffering so much loss, she continues to take in more older dogs who just need a place to live out the rest of their lives. They may be with her several years or several days. I don’t know how she does it, either. I think this is the perfect way to honour Frankie. Thank you for continuing to give so much even in such a difficult time. I don’t throw the term “angel” around much (what with being an atheist and all), but your friend is one. Perhaps the program to which she belongs can apply for Grey Muzzle funding out of Frankie’s Fund. Honestly, doing this fundraiser is a huge help at this difficult time. It’s a way to keep Frankie in my thoughts in a more positive way that looks to the future. And all the tech stuff is a nice (i.e., annoying rather than sad) distraction. I couldn’t help but cry when I read Pamela’s blog post this morning about the 3 things she learned from you…it brought back memories of my sweet poodle, Kissy. And once I finished reading it, I decided that I had to donate to Frankie’s Fund. Kissy was 15-1/2 when she passed. She had been suffering with kidney dysfunction and it had gotten to the point where I just could not allow the suffering to continue. Now my two Golden Retrievers are seniors — albeit healthy so far — and I have to believe that they will die of old age rather than the effects of an illness. I love this idea you had, and I’m happy to donate what I can to help you reach your goal. Thank you so much, Sue, for this comment and for your donation. I saw your comment on Pamela’s blog this morning and — since you’re in the guilt free zone — I’ve got to tell you not to worry about Kissy eating people food occasionally. During Operation Spoil Frankie, I gave him a lot of junk food and his blood sugar wasn’t affected. Which made me wonder about my strict diabetes restricted diet for most of his life… But 15.5 is a good long life, and Kissy went knowing she was loved. I hope your senior Golden Retrievers are in good health for the rest of their long lives! Georgia, sorry it took me so long to acknowledge — and thank you — for your donation. I was having technical difficulties with this site. I’m so sorry for your loss of Chico, but I’m sure you take solace from the fact they he knew he was loved until the very end. Of course you still miss him. And Chaka too. I don’t know why I am so dense today, but in the place on the donation page where it asks for an email to send the acknowledgement to, what do I put? Not dense at all; I just looked at a few of the donations sent and some people put in their own email addresses, some people put in mine. It’s not very clear. I think it’s designed to indicate if you want the donation made in the name of another person besides me. I will ask! Most people put in the email address at the side of the blog: writestf@me.com. Thanks so much for donating! I’m sorry for loss, I lost my Buster this year, but why did you not post my message earlier? Strange…. I did post it. Did you not see it? It’s under the Pet Blogger’s challenge, not this one — maybe that’s why? This is something I have harped on for YEARS – and spent countless hours begging people to let go of the fear of the pain losing a pet brings and take in those “disposable” seniors, often dumped for a younger dog that demands less care and cost. The pain goes away – it diminishes with time and the REWARD? It lasts forever! Every time you see that photo or watch that little snippet video you made of some special something you did together – even something as simple as snuggling – it all comes flooding back and you feel high with the love – NOT that you gave at the end but that you RECEIVED in the end, in THEIR special time of need – you feel important, like you’ve stepped up and done something important, something that matters that made a difference. The moment you walk out of that pound with that dog your life is forever altered – you are a god – a hero – a man among men, woman among women – that dog will look up at you with so much love in their eyes you will be breathless – like you are drowning in this enormous flood of affection AND THE REMARKABLE THING – THE MIRACLE it never stops – that look of total and complete adoration lasts until the last glint of life shines on you and you alone as their redemption, the guardian angel that they had given up on but who came through at the end and brought them the peace and love they so hungered for – a love most of them lost. They had it at one time and it disappeared – at one time they had it all – a dog’s perfect life – as they waited day after day – night after lonely night wondering where their human had gone – what could they possibly have done that was so awful that their human would never return for them – and the flicker of hope turns to despair – they miss their warm bed, the soft voices they so loved all those years, the full belly and nummy treats – the walks around the neighborhood greeting all the neighbors – so they curl up in a little ball at the back of the kennel – alone – terrified – with no hope – just waiting to die a lonely death – UNTIL YOU. Due to my health I had to quit doing active rescue in 2001 – and I took in my first senior – I have 14 seniors right now – the most I’ve had to date – large dogs (they are harder to place under ideal conditions than small dogs – much less as they reach the age of 9, 10, 12 even 14) – I promised them till death parts us when I took them home and I will be (and have been) holding them when they pass unless they pass in their sleep. As promised, the love in my eyes is the last thing they see – and my touch is the last thing they feel. It is the hardest thing you will EVER do if you commit to loving a senior – and better commit to a new one each time one moves on – but on YOUR deathbed you will see ALL THOSE FACES waiting to greet YOU on the other side of the Rainbow Bridge – it simply could not get any better in the afterlife. SUPPORT THIS PROJECT – MAKE THIS DREAM POSSIBLE – AND GO OUT AND DO IT – BRING ONE OF THESE PRECIOUS SENIORS INTO YOUR LIFE – BE A HERO – SET AN AMAZING EXAMPLE FOR YOUR CHILDREN AND GRANDCHILDREN – WE CAN ABSOLUTELY CHANGE THE WORLD BUT IT TAKES MORE THAN TALKING ABOUT IT!!!! DONATE THEN — ROCK YOUR OWN WORLD AND DO IT. Thank you for this lovely note — and for all you do for senior dogs. Fourteen of them now — wow! What great karma points you are accumulating too here on earth! Although Frankie’s Fund is closed, by all means make a donation to Grey Muzzle. They do wonderful work.